Jennifer, I really love your bowls. The colors are so fresh and fun! great job. Great color in you stack of bowls - very sweet. Thank you for sharing with us today. Your bowls are so pretty! 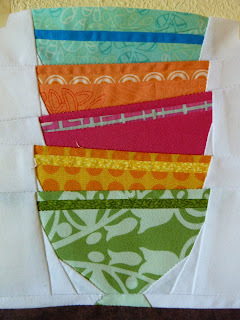 Really lovely, have fun with sewing even more! I just had a quick look at some of the others and they are really fun. I like yours one of the best though. I love your colors, and I cheer you on to go on and make a beaytiful something (quilt, placemat, mugrug, tablerunner) out of this bright start. Go, Jennifer, go! They look absolutely beautiful (so far). Look forward to seeing the finishes bowls. Great job and great colour choice! Thanks for sharing your bowls with us. Great job! Your bowls are wonderful. You have chosen wonderful fabric. I think that sewing the bowls are very addictiv. It was hard for me to stop sew, so you will find out on Monday , when it is my day. Great work! Bet you keep going and make a huge stack of bowls! Nice starting point - way to go! If you finish your quilt and would like to see your work in my guest gallery please contact me at info@reginagrewe.de. Love the colours will make a great set of bowls. Your bowls are beautiful! I like the way the rims are done. Great job! Your bowls are wonderful and love your fabrics choice. Oh yes, keep up the good work. Your bowls are so pretty. Keep going, they look great so far!! Your colors are wonderful - look like bowls of sherbet! You're too far along to not finish. I can imagine it will be an awesome project. Thanks for sharing! Your bowls are do bright and cheery, very nicely done! Thank you for sharing them, happy quilting! Great fabrics! Have a great weekend. Jennifer, your project is great! I love the color choices you made. I hope the move went smoothly and that you can get your sewing space back up and running. Great colors for your stack of bowls. Thanks for joining in the fun and sharing your project. Hope you are getting more settled in after your move. Your bowls are coming along beautifully. The bowls are looking good. Congratulations on your new home. Your bowls are so colorful! I love them! Jennifer - I love your color choices - so many possibilities to add batting, borders and quilt, but that will come in due time when other priorities are resolved. Best wishes with the move, I know it's never easy. Thanks, from California. I love the bright colors in your bowls! Hm......reminds me of popsicle colors! Too cute! Great colors!!! Makes me hungry for whatever was in these beautiful bowls!!! Beautiful bowls and I love your bright, fun colors! Nicely done! I like your colour choices. Your bowls are so bright and cheerful, I love the fabrics. I am sure you would have fun adding a few more bowls and figuring out how to finish it when the time is right. Pretty. Loves the fabrics choice. Very nice choice of colors. I really like the scalloped effect in the orange bowl. I'm sure you will have this turned into a completed project in no time. Your color and fabric choices are beautiful! !1 Great job! Your bowls are so pretty....Can't wait to see them finished. Thank you for sharing. Love the fabric choices sometimes life just gets in the way. I know they will be lovely when you finish. Wow! I just love your fabric choices, Jennifer. Your bowls are beautiful! Thanks so much for sharing and being a part of the hop. Yum yum, your bowl make me think of sherbet! Soo pretty! Thanks for sharing your bowls with borders. I like the colors you selected and the interesting bands/borders on the bowls. I think that is a Kool technique. The orange band looks like scalloped edging. I love the bright and cheery colours you used! Your bowls are wonderful, they remind me of Fiesta Ware, my favorite dishes! I really love your colors in the bowls. Great combination of colors. Fun and festive. Thanks for sharing. Pretty stack of bowls! I especially like the arc trim on the orange bowl! You have a happy rainbow stack started! Have fun finishing up. Love what you have started so far...I think it will end up being awesome! I like your fabrics and more bowls in those fabrics will be great. Great bowls in wonderful cheerful colors , thanks for sharing . I love the pretty colors. Nice job! What you've got is the beginning of amazingly cute! Keep going!! Yes, these are so cute! Love the fabrics! Such a cute stack! Thanks for sharing. fun colors. You did such a nice job. I can see you have done paer piecing before. Great job! I love your choice of colors. Great job! Your fabrics are bright and cheery. Your bowls make me happy. Your stack of bowls is so bright and cheerful! Thanks for sharing! Nice bowls, I will come back to see how you finish this project. That's one good thing about not being quite done, it does give the opportunity to add or play with it. I love the colors you used, they are right up my alley!! been looking at your other stuff too....Love the Fandango DWR, too! If I had anything big I would send it to you. I may have one small piece, like 6" or so, not sure. Always nice to start something new, and then being able to add to it afterwards! Good start so far. Thanks for sharing.